How to make runny mince. It’s delicious – honest! 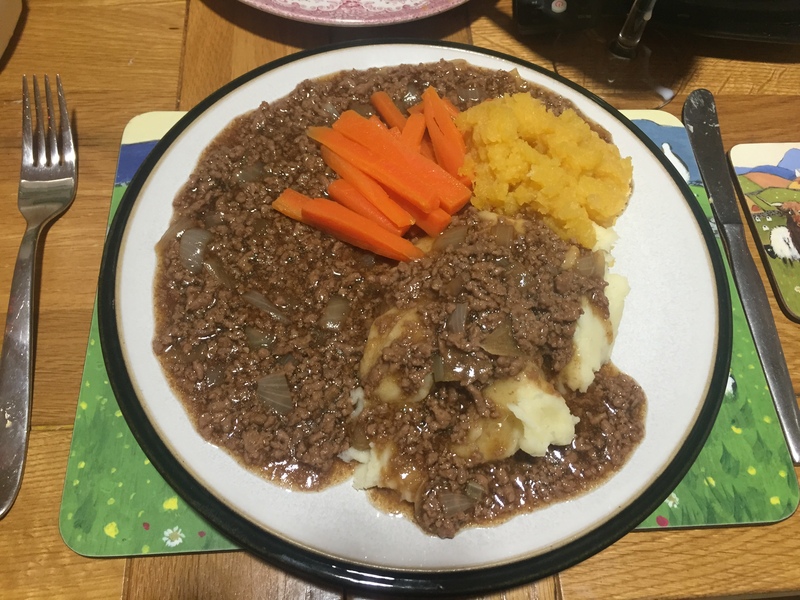 For all of my formative years, our Saturday evening meal was runny mince with mashed potato and carrots. It was a working class household in the 1980s (and ’90s), and the carrots were from a tin – and we shared one small tin between four of us. Looking back now I wonder how we had enough to go round! It certainly makes me think when I am dishing up hearty portions for our family now. Despite its simplicity, I adore this dish and it’s possibly my number one taste of home. I have fond memories of being allowed to take my plate into the living room so that I could watch Beverley Hills 90210 in peace, free to concentrate on the antics of Brandon, Brenda et al while tucking in. It was also the first meal that my parents taught me to cook. 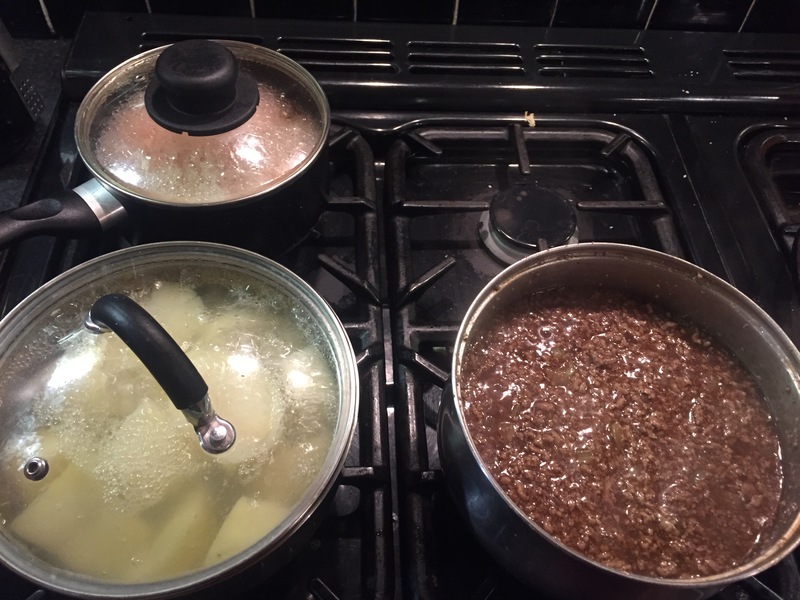 I recall my mum telling me ‘you’ll never starve as long as you know what to do with a bag of spuds and a pound of minced beef’ before I left for university! Whilst at home recently, it was requested as an evening meal by Mum, so, given that it had fallen out of favour with us a bit, I was delighted to oblige. To accompany it, I put on a pan of potatoes to boil plus carrot batons and some turnip / swede. Peas would also be nice, if you preferred. As ever when cooking mince, I dry fried it whilst breaking it up into pieces, before draining the fat and then adding a large chopped onion, one stalk of celery (finely chopped). I let the onion and celery soften over a low heat for as long as the softening took. I then added some lukewarm water to the top of the mince, added a dash of Worcestershire sauce and Bisto powder (made into a paste into a cup) and brought the heat back up gently, stirring frequently, so that it came together. Beware – Bisto powder added to very hot water instantly turns into black tarry lumps. My mum likes her runny mince really thick, but I refrained from hitting her preferred levels of gloop. After draining the potatoes and mashing them hard – lumps are the enemy – with a knob of butter, it was all ready to go. Even though it’s a meal which many people would look at and think ugh, how unappetising, I loved it. It was hearty, tasty and simple, and really nostalgic. And I’m a sucker for nostalgia. 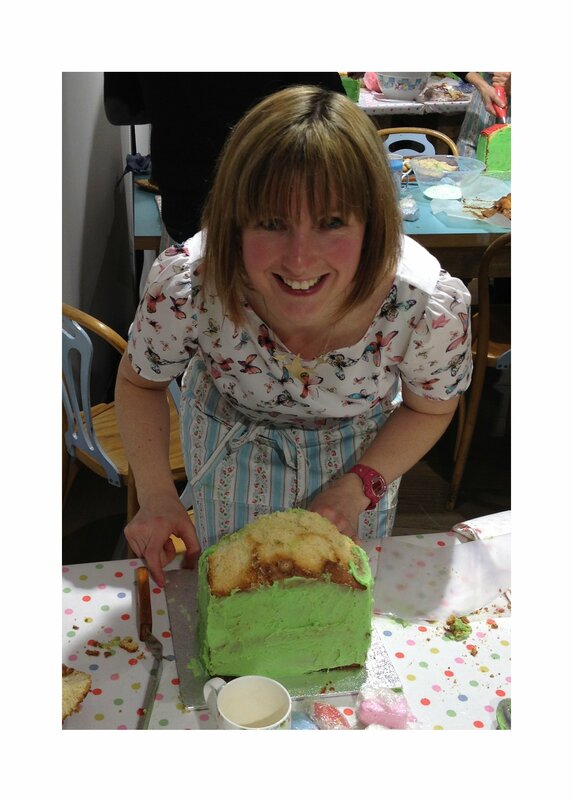 In this wet and miserable January, I’ll certainly be making it again soon. After a prolonged period away from the hob, and, reluctantly, from this blog, I am finally back in action. We have had some tough times, but I have re-donned my apron and am once more capable of brandishing a wooden spoon and feeding our family. And it seems like perfect timing, as it’s definitely my favourite period of the year for all things culinary. The weather has turned chilly, and we’ve stocked up with root vegetables in preparation for autumn and winter warming meals. I have already knocked up a pot of my dad’s stew this week and then my mind turned towards one of my favourite tastes of home – vegetable soup. A version of this is made all over NI using one of its homegrown products, about which I have blogged before, a unique fresh vegetable soup mix which is sold in every supermarket. 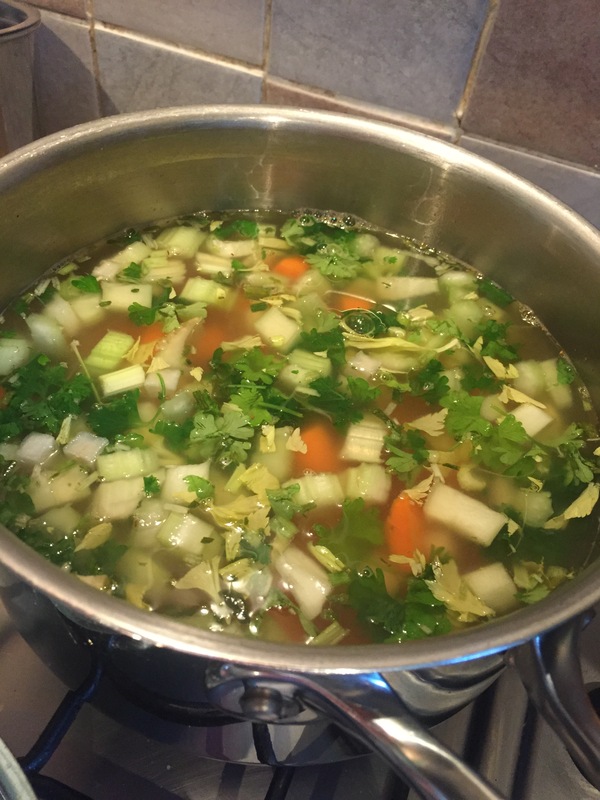 It’s a combination of very simple ingredients, including carrots, parsley and soup celery and means that a healthy veg soup is a doddle to make. Making it while living in England is slightly less of a doddle, but still very simple. The main thing you need to remember is to soak your lentils etc overnight. 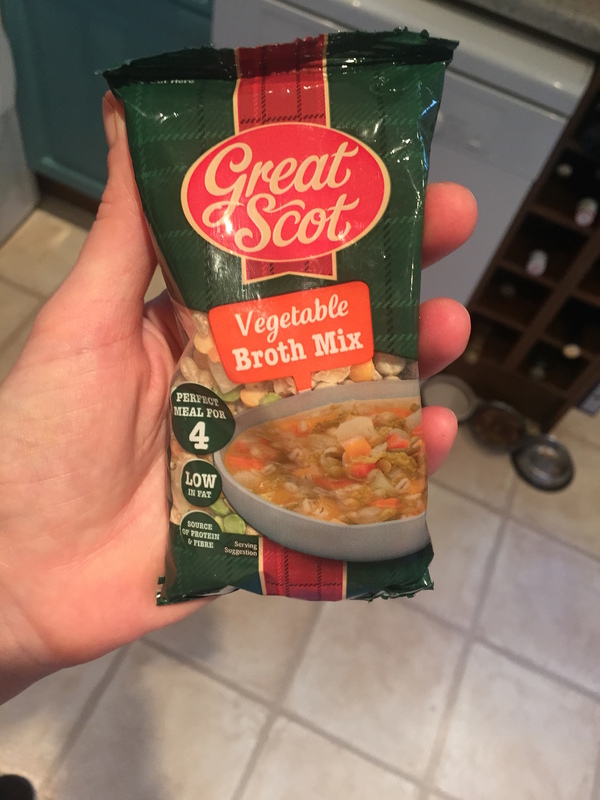 Even though I cannot find a good English soup lentil mix, our celtic cousins in Scotland have come to the rescue with Great Scot vegetable broth mix. It’s sold in our local Asda in handy little 125g sachets which are the perfect size to make one big pot of soup. Each sachet is a perfect mix of pearl barley, yellow and green split peas, marrowfat peas, split lentils and vegetable flakes. And after it has soaked, all you need to do is rinse it and cook it in a pan for 40 minutes or so with vegetable stock and a hearty portion of chopped carrots, fresh parley, celery and leek. As is traditional at home, I like to add a few whole potatoes and a bit of shredded chicken in there too. Hot and steaming with a chunk of buttered bread, it makes for a pretty unbeatable bowlful for lunch or an evening meal. I am certainly looking forward to replacing sarnies with it for my packed lunch at work tomorrow. Spaghetti Bolognese must be a family favourite in every home – we have it regularly! It’s one of the best things to make with the ubiquitous mince in our gaff, and it’s a great way to get veg into a child. I add carrots, red peppers, mushrooms, onions (of course) to ours and then blitz the sauce in the blender before serving to our daughter. It’s something I was taught to make, not by Dad (who was a fan of using just a jar of a popular sauce), but by my university friend KD. After dry frying the mince, draining the fat and adding garlic and onion as normal, she taught me to add some tomato puree, then some mixed herbs and canned tomatoes. These days, I am a fancy pants who throws in a swig of marsala or red wine, and I’m in heaven if I have fresh basil. Oh, and I never had money for parmesan in my student days. These days, I grate it liberally all over, the crowning glory of what’s one of the simplest, and tastiest, family suppers around. So, thanks K! I don’t think I have ever told you how much I appreciated your introduction to a semi-proper spag bol. I promise to make it next time you visit. The other half wanted a ‘nice’ evening meal yesterday. We had steak, mushrooms, onion, and some green veg, so I made some healthy wedges baked in the oven, sprinkled with a little chilli powder, and seasoned and drizzled some oil over the steaks. Then I thought it would be nice to make a sauce, like a classic Diane, but I couldn’t find the recipe in any of my books. I resorted to memory and a few variations from online, so I put a bit of boiling water in the steak pan to lift the tasty bits from their cooking, added a bit of beef stock, then some dijon, worcestershire sauce and a bit of red wine. I added a few tablespoons of cream at the end and it was lovely. Retro. And fab. Of course, we drowned our dinners in it, but, by the end, we’d mopped it all up. Since the idea behind this blog was that I would write about the unpretentious simple food I make at home for my family, food which has been inspired by the meals my parents taught me to make, it’s very appropriate that it begins with a Northern Irish Stew.